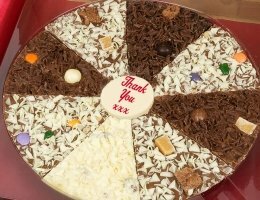 Our personalised chocolate gifts can be customised with the person’s name, their age or a well-wishing message of choice. You have 24 characters to create an edible message they’ll love. You can also choose the flavour to suit their tastes. 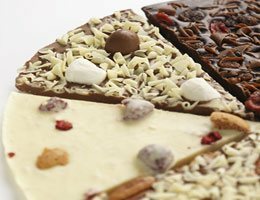 Perhaps they love milk chocolate or have a craving for caramel, we have a wide range of flavours and toppings to suit everyone. When you receive a gift from someone, regardless of what it is or the amount of money spent, you hope that the person who sent it put some thought into it. You want to know that person has specifically thought of you and your tastes because that’s what a gift should be about. Personalised gifts say just that. Whether it's a personalised gift for him or for her; a special age like an 18th or 21st birthday you want to celebrate;, or maybe you're looking for a personalised baby gift or personalised Mother's Day or Father's Day gift, we have several personalised chocolate gift options for you to choose from. Firstly, you can choose one of our creative and scrumptious flavours based on their dessert preferences. For example, we have invented several unique chocolate combinations; a jelly bean jumble which combines rainbow drops, milk chocolate and jelly beans for those who have a sweet tooth; honeycomb and marshmallow for those who love rock road; a nutty treat for nut lovers; and raspberrymac which is so incredibly indulgent – a white chocolate base, with amaretti biscuits and freeze-dried raspberries. These are just a few options of what we have to choose from. Secondly, we have the traditional personalised option. 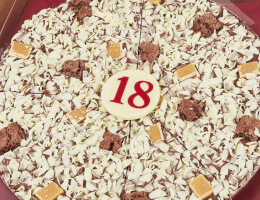 You can completely customise the pizza with a message of your choice. Our chocolate gifts come in deluxe packaging which will make the recipient excited alone, but to open the paper and see a message specificly from you looking them straight in the face is a surprise they’ll never forget. You can create a truy unique plaque that is special to them with whatever message you want – whether that’s a good luck message, a birthday number or their name. You could also design them a chocolate gift from scratch. Select the chocolate you want, the toppings, the size, everything. Go wild and create something completely unique. However you choose to personalise their gift, the choice is yours. Whatever you choose though, you can relax safe in the knowledge that they will love their present.